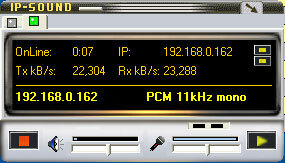 IP-Sound is a windows basedÂ application for audio exchange in a pont to point mode. It has been designed to work over a TCP/IPv4 network (internet). The main purpose of IP-Sound is to provide low quality audio 8-16kHz, with low latency for use together with remote control software for amateur-radio amateur equipment. I’ve used this cool application exactly to test my radio remote control over the internet.